Yes…In reality, it’s still the best method for generating B2B and B2C leads, nurturing those leads, and scoring tons of conversions. In spite of millions of deletes, unsubscribes and spam messages, email marketing has stood the test of time. But to build an effective email list, there is a lot of hard work and research behind the screen. We are going to discuss all those information here in detail. WordPress Email Subscription Plugins – Why It Is Important? Many bloggers ignore the importance of building an email list unless and until they see the impact email lists have on driving traffic and revenue. I have seen many bloggers more focused towards building their email list more than organic traffic. Because in your niche based email list you have like-minded customers who are interested in your product or services. But your organic traffic has less percentage of lead generation possibilities. Imagine you have a list of 1000s of subscribers all you need to work on is writing an email that converts. One of the easiest ways to build an effective email list is just by adding WordPress Email Subscription Plugins. Implementing plugins means adding opt-in forms in certain locations of your website including sidebar and below content area. You can use A/B split testing with multiple opt-in forms to see which one has better conversion rate as compared to others. Heatmap tools to know more about your visitors and where they click, where they scroll, what makes them leave and more. Stop guessing and start seeing. Creating polls for your visitors. Creating online surveys that ask questions to your visitors. For that, you can use tools like Qualaroo. There are so many strategies but your action is required to find out which one works best for your business. Let's jump back to the easiest method you can use to grow your email list. No matter what email marketing tools you use even if its Constant contact, Aweber or any other email marketing platform. You still need an effective approach to collect emails for your marketing purposes. There is a good number of plugins available in the market for both FREE and Paid version that makes it easy to add opt-in forms on your website powered by WordPress. In this post, I will share some of the best list building plugins that can help you get more email subscribers. When I was doing research to find the best email plugin for WordPress, I found many people are using Thrive Leads, one of the best easy-to-use plugins. 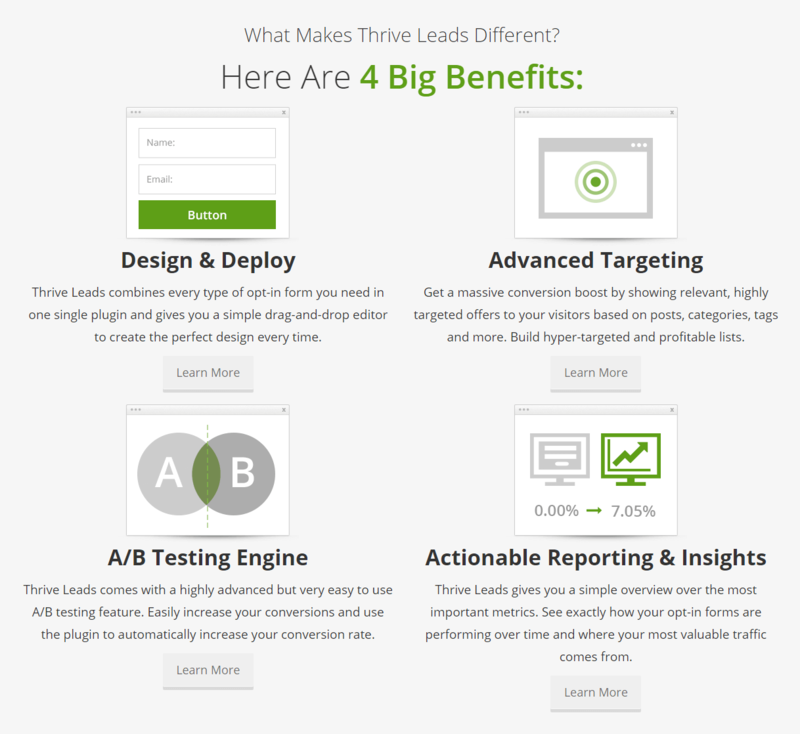 Using Thrive Leads, there is no longer need to rely on one way to generate leads and also no need to install multiple plugins. It's the all-in-one list-building solution you've been looking for. It is one time buy for life time. With this plugin there will be no limits to your customization. Are you using OptinMonster on your WordPress blog or website? This WordPress plugin makes managing your campaigns easy! 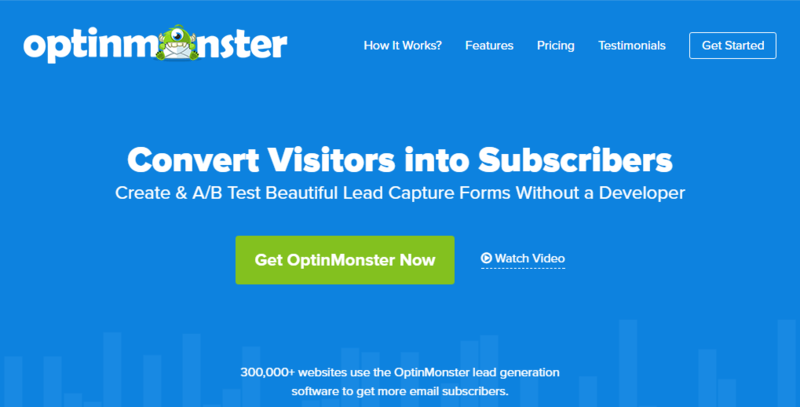 With a list of amazing features, OptinMonster ranks a second place in the list of WordPress Email Subscription Plugins. With this plugin, you can ask visitors to join your subscription email lists through different ways. You can add this subscription form within your sidebar or at the bottom of your webpage. Creating high converting forms will be few minutes job. They also have page-level targeting feature to display specific offer based on interaction and location of a visitor on your website. With this plugin, you can also create smart popups and slide-in optin boxes which is unblockable. There are many more features like easy A/B testing for higher conversions, full-screen welcome pop-up, mobile specific pop-ups, adjustable floating bar, in-line forms, and MonsterEffects to give animated effects to your forms. This plugin is entirely compatible with all the email marketing campaigns including GetResponse. SumoMe is a WordPress plugin that offers a plethora of tools to help you grow your email list. This plugin let you add optin, contact form, sharing icons, notification bar, and other lead generation campaigns. It’s a free list builder app developed by AppSumo. SumoMe supports almost all major email marketing services like MailChimp, ConvertKit, Constant Contact and Campaign Monitor. Using this plugin, you can create well-designed popups that turn site visitors into subscribers. Via SumoMe, you can set to show a popup when the visitors are about to leave from your site. You will find premium optin popup plugins and SumoMe offers it for free and is very simple to install. You'll also get reports, insights and customizable floating bar to attract more subscribers. Hello Bar for WordPress plugin is a really simple plugin that allows you to copy and paste your Hello Bar code snippet from HelloBar.com. “Hello Bar” is open source software and the main aim of Hello Bar is to improve your website’s conversion rate. Therefore, while implementing a Hello Bar, you need to make sure to include a clear message targeting your audience to complete particular action. Here is “How to Start Using Hello Bar” for your blog: Visit the Hello Bar Home Page and begin by adding your blog’s address and then create your profile. Then you will be directed to the dashboard, you need to click on “Create New” option and then choose any one of the options listed there. They recently launched a PRO version of their services with few high end features and no force advertisement. Hello bars can also be used to share information, news, or announcements with your audience. It is more of a marketing tool than a simple email list builder plugin. It'll help you with growing your email list. Provides social sharing options for your posts and images. And will help you to grow your social following. A/B testing feature is also available with Hello Bar. Leadpages can make a great addition to your existing WordPress site and publishing pages to your site is easy. As the name says it is the most effective tool for generating leads and sales for your business with different types of platforms. It will let you create beautiful landing page templates with its simple drag and drop interface. Integrate with all popular marketing platforms. Comes with over 160 FREE mobile friendly Templates, LeadPages provides a wide range of web page building items for gathering more leads from website visitors. With LeadPages you can sell your digital products and services with built-in payment feature, all you need a free stripe account. Comes with easy drag and drop customization to ease your design work. Integrated with all major email marketing services and PayPal. This plugin offers the A/B split testing so that you can assure that your techniques for list building is effective and result oriented. This plugin comes with the SMS optin code that serve as amazing yet unique features, while the one click signup links are ease for emails and websites. WP Subscribe Pro is the must-have plugin for every WordPress Blog and Website. Having this plugin will boost your conversion rates for newsletter subscription and result in more traffic and income. Developed by MyThemesShop, WP Subscribe Pro provides all the amazing features you will need for building an effective email list for your website. It comes with exit intent trigger and built-in widget to display the optin form in sidebar or bottom of the webpage, pop-up animations, and is fully compatible with popular caching plugins. It integrates with marketing services like Feedburner, MailChimp, Aweber, GetResponse and much more. ConvertPlus is a WordPress popup plugin that can be used to create effective popups, opt-in and subscription forms. Often called as “All-in-One WordPress Plugin”, this easy-to-use plugin helps you transform traffic into leads or visitors into subscribers. It’s an all-in-one wordpress plugin that transforms your website into a lead-generation power house. Using this wordpress plugin, you can grow your email list as bigger as and faster than ever before. You can also create beautiful pop ups in minutes & start converting your website visitors into subscribers, social followers & customers. With over 100+ beautifully designed templates, and featured with exit/opt-in popup, slide-in popup, on-click popup, video popup, social popup, widget boxes, embedded forms, info bars, ConvertPlus is treated as the most powerful popup & lead generation plugin. MailChimp is a WordPress add-on that enhances your site with extra features. This plugin is free for lists up to 2000 subscribers, that’s why it is the newsletter-service of choice for thousands of business owners. This plugin is often called as the “Second Brain”. And this helps you find and connect with your audience easier so that you can build your brand and sell your products/services within a second. With good looking signup forms, user-friendly templates and multitude collection add-on plugins, MailChimp comes with several benefits including, Multiple forms (with AJAX), An easy way to style your forms, Detailed reports & statistics, Email notifications, Advanced MailChimp e-commerce integration for WooCommerce. Whether you’re looking to sell your products, share some kind of announcements, big news or tell a story, MailChimp WordPress Plugin makes it easy to create a great email marketing campaign that best suits your message. These are few of the most commonly used plugins for building your email list. If you have any questions about how to install/configure any of these plugins on your site, feel free to drop a line in the comment section below. So now, it’s time to get started – pick out a plugin and start building your email list like wildfire. I like leadpages. I about to use it for my blog. Leadpages is sure one powerful tool to go for. If one can afford it this would be the perfect one to grow your email list. It’s been long since we talked. My personal favorite from the list are Thrive Leads and ConvertPlug. I’m yet to try LeadPages but given that every big blogger use them, I’m pretty sure they must be amazing. Good to see your comment here. It’s really been so long. Thrive Leads is my favorite too. And Leadpages is a bit expensive to go for as for now but yes as you said so experts are sharing good words about it.